REFUGE IS ANYTHING TO WHICH ONE HAS RECOURSE FOR AID, RELIEF, OR ESCAPE. 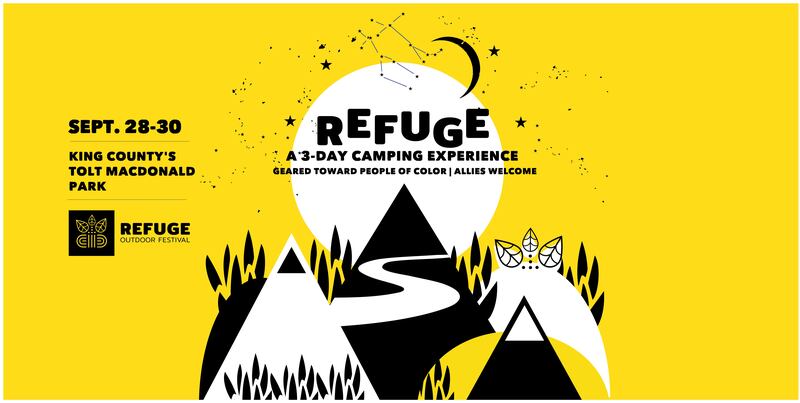 2018 will be the inaugural year for the Refuge Outdoor Festival; a 3-day camping experience geared toward people of color. Centered on building community through outdoor recreation, conversations (community talks, workshops), music, and art that appeal to a diverse and inclusive audience… Simply put representation matters. That is why we are showcasing the voices and faces of people of color who enjoy, want to participate, or are employed in the outdoors (recreation, conservation, and so much more). Because life is hard and we all need opportunities to have real conversations. In addition, to build community and connect people with resources for ongoing engagement. The Refuge Outdoor Festival is creating a space to explore and celebrate diversity, nature, and life. By bringing together people of all ages and recreation levels we, the people, can meet the needs of a diverse and inclusive community. This entry was posted on August 16, 2018 by Seattle Black Feminists in Uncategorized and tagged Festival, Nature, Outdoor.